Dr. Makram understands that for you the worst part of tooth loss is the affect it has on the appearance of your smile. Of course, he wants you to be satisfied and happy with your smile, so replacement is always recommended. However, you still need to decide which tooth replacement option is best for you. While a bridge, a partial or a full denture all do a fine job, nothing beats dental implants. These replacements substitute for both the root and crown of a missing tooth and are, therefore, the closest imitation of what Mother Nature intended for your smile. Read on to learn more about the many benefits of dental implants in North Naples. Beyond appearances, there are several other reasons that make tooth replacement essential. Consider the fact that even one missing tooth increases your risk of decay in other teeth as well as gum disease. And considering that gum disease is the leading cause of tooth loss in the first place, treating and avoiding this bacterial infection in the future is essential to your oral and general health. In addition, that vacancy in your smile can cause nearby teeth to shift out of place, and the opposing tooth may begin to extend down. Both of these can lead to bite and alignment problems. As mentioned above, dental implants are unlike other replacements because they most closely mimic a natural tooth. But what makes this so beneficial? A tooth root does more than just firmly hold your tooth in place. That root has a lot to do with the full and youthful appearance of your face, especially your jaw. When you lose a tooth, there is no longer a root to stimulate the healthy new bone tissue growth your jaw needs to maintain its natural shape. With a dental implant in place, that stimulation continues so you avoid the haggard appearance that often happens as a result of tooth loss even if a bridge or dentures are used. As a graduate of the Advanced Prosthetic and Surgical Program at Temple University as well as the prestigious Misch International Implant Institute, Dr. Makram is very qualified to rebuild your smile with dental implants. Depending on the extent of your tooth loss, he will surgically position the required number of implants in your jaw. As you heal over the next few months, the implant and surrounding bone tissue fuse to form a firm anchor for your eventual tooth restoration. 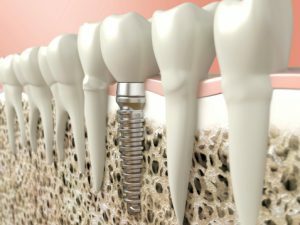 Dental implants may be the correct solution for your tooth loss. To ask a question or to schedule an appointment with the implant dentist in North Naples, call our office today.